is the theme this fortnight at Fashionable Stamping Challenges. For this card I chose my trusty, and long forgotten, three men stamp. And my also little used and forgotten background stamp with the french script. The three men were stamped onto book paper and cut out. 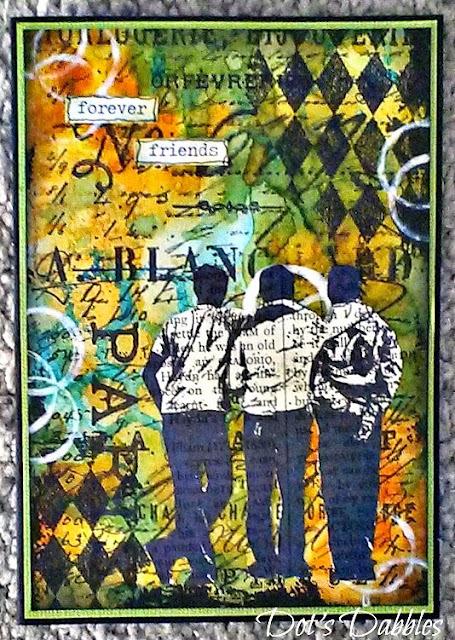 And the background is full of layers using lots and lots of ink, stencils and stamping (including the background stamp) before adding the men. PLUS IT IS HEAPS OF FUN!!! I love this Dot great stamp on a great background. Another delicious mans card Dot with another amazing inky background. You still rock sweets. WOW this is fabulous! I love the background and great image too. Oh I remember those cards with those guys, and this one is just super! Great background and fantastic colours!!!! Another fantastic creation Dot, love the men stamped onto the book paper and that is one awesome background. Great card – fabulous background! Oh just fabulous, I love the men stamp, I have it lurking somewhere, and you have also used my favourite papillon back ground stamp. Amazing and wonderful inkiness ! Wonderful background. Looks perfect with these guys. There is so much to look at and it fits perfectly. Thanks for sharing Anneke. A fabulous card Dot, the background has so much depth. Always love to see these 'guys' – love the stamping on text. Fabulous background, super stencils and inkiness. love your three guys, its good to see them again. p.s. Thank you for joining us over at Stamps and stencils. Wow an amazing card, love the background and the stamp, gorgeous colours. Yeah, I love this image, too. It's perfect for the background.